As we have seen across the Gulf and beyond recently fire alerts and, more disturbingly, actual fires in high-rise buildings are a worryingly common occurrence. These buildings create challenges and circumstances not found elsewhere in the built environment, being unique not only in terms of their height, but also in their capacity and layout. While people are of course the priority, fires in high-rise buildings can also have a major financial impact in terms of repair costs and related losses. They are often landmark buildings so if there is a fire there is also ‘landmark’ reputational damage and their size means any fire incident can also impact on the surrounding urban area. During a minor fire incident on the 33rd floor of London’s Shard (Western Europe’s tallest building) in 2015, the alarm system – an Advanced system as it happens – did its job and directed a controlled evacuation, while the fire was quickly extinguished by sprinkler systems. The fire panel in a high-rise installation must be up to several challenges, as what can be simple in a ‘normal’ building becomes much more complicated in a tall one. Evacuations in high-rise buildings can tie up huge resources, shut down large areas of a city, close businesses and even risk lives if the evacuation is not managed effectively. It’s imperative to only evacuate when a fire is real. A false alarm management strategy must be in place and be represented in the system programming. Solutions like Advanced’s AlarmCalm use automatic and human validation to ensure a fire is real and avoid false alarms and related unnecessary evacuations. The challenge here is time or, more specifically, the amount of time needed to evacuate the building. With some high-rise structures having well over 100 mixed-use floors, with thousands of occupants, it can take over an hour to evacuate them all. It’s not a case of switching on the strobes and sounders and expecting everyone to leave. This would undoubtedly result in failure to evacuate, queues, clogged evacuation points and possibly crush events or deaths, especially in the panic of a real fire. The evacuation process must be managed in stages so staircases and emergency exits can handle a safe volume of traffic. The areas closest to a fire need to be evacuated first in what can be a rapidly evolving situation. The floors above and below the fire come next and, at the same time, the floors at the bottom and top of the building (if the fire is in the middle floors), will be evacuated. There can be a lot of signals occurring at once in adjacent areas (vertically or horizontally) and in open atria and common areas that span many building compartments. These can include different strobe, beacon and sounder patterns or recordings, and even live voice notifications from the fire service, indicating when users should prepare to evacuate. Where voice sounders are used, the fire system should ensure that any messages are clear and understandable, remain synchronised and properly indicate what is happening. There are various national and international standards that cover this. Redundancy is also important. Standards dictate how much of a system is permitted to be affected by a fault. Some audio systems distribute message generation across the fire network, while others use a central amplifier. The former provides more protection in the event of an amplifier failure. In the latter if the central amplifier has a fault or is affected by the fire, all audio notification could be lost. Redundancy of the fire system is a much larger consideration in high-rise buildings and there are various options available, from backup processors to complete fire panels, that can be applied globally or in very high risk areas. Networking topologies can also supply some level of protection for faults and these should not be ignored. 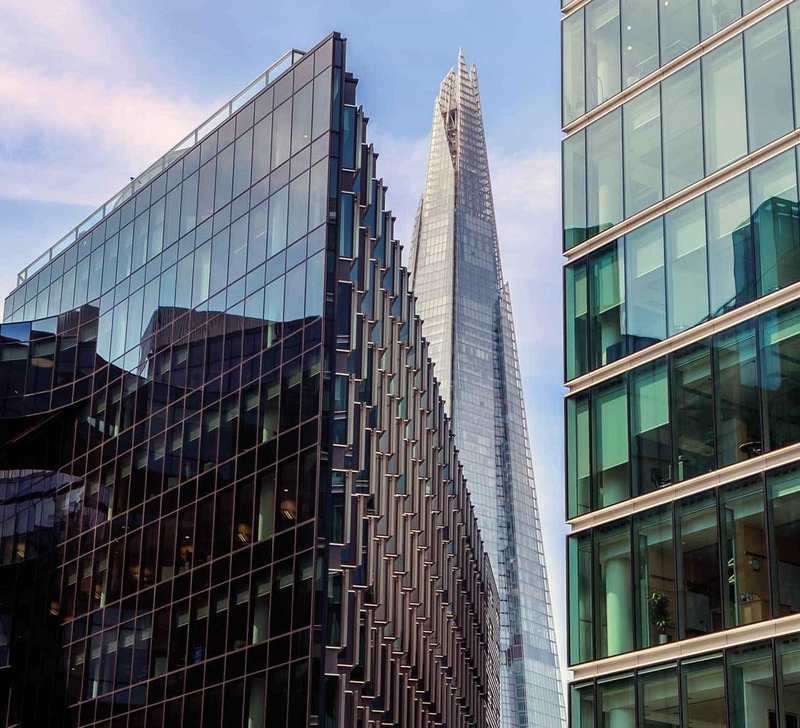 London’s Shard, Europe’s tallest building, is protected by Advanced fire panels. Another challenge in high-rise buildings is the importance of smoke control and airflow, both in aiding firefighters in controlling the spread of the fire and in ensuring that evacuation routes are kept clear of smoke. This can be managed via fans and dampers, using either the building’s HVAC (heating, ventilation and air conditioning) system or using a dedicated system to manage airflow through the building in the event of fire. The air handling system in any building is highly significant when there’s smoke or fire, but in a high-rise it can be vital and can have huge influence over the spread and extent of the fire, as well as the smoke, which often poses more of a threat to life. Modern smoke control is an active and dynamic tool. The best fire systems can manage smoke and airflow through a building both automatically and manually, and can help keep evacuation routes clear of smoke by pressurising stairwells, for example. They can also clear smoke from a particular area, help contain a fire or purge smoke from a building after a fire is extinguished. The operation of such systems is highly complex, with many layers of detection and interlocks required to guarantee safe operation, so the speed and power of the fire panel, and the ease with which it can be programmed and controlled are vital. Challenge four is time again. As we have seen, the fire system in a high-rise does much more than merely detecting a fire and notifying the occupants. It controls critical systems, manages the building’s response to each individual incident to protect life and property, and helps the fire services do their job. A fire system is mandated in a building and the best are highly intelligent, with the ability to control many operations vital in safely protecting occupants and infrastructure. The panel needs to remain operational for long periods in adverse conditions, even as cables degrade (due to fire) or ultimately fail. As cables break down, the alarm panel will need to contend with erroneous or spurious signals from devices and peripherals, which must all be filtered and processed. Additionally, in a fire condition everything can be ‘on’, so the panel needs to be designed to cope with higher currents and fluctuating voltages across the system. Distributed systems that can continue to operate independently as standalone units, without requiring the control of one master panel, will perform better in a high-rise installation. Built-in redundancy, diverse routing of cables and fault-tolerant networks will also help here, and can also reduce installation costs. Challenge five is networking. Specifically, the importance of rapid data transfer and control across a high-rise building’s fire system. The system in any complex building, especially a high-rise, will be networked with thousands of individual devices, linked to hundreds of panels and repeaters. They will all work dynamically and/or under the control of the fire fighter, fire marshal or responsible person in charge, without permitting access to anyone else. Getting information to the person in control so they can interpret and act on it quickly is vital. They can make real-time decisions, as the fire incident develops, and manually override any automatic evacuation or cause and effect strategies. What messages are playing on what floors? Has a floor been safely evacuated? What is the status of the smoke management system? Is it doing its job? If not, has a fan or damper failed in the wrong position, potentially fanning a fire or allowing smoke to travel to adjacent areas? Have flow valves operated in each area or have pumps failed, meaning they’re not available and the suppression system has failed? Feedback needs to be almost instantaneous. If a firefighter decides to evacuate the 31st floor, but it takes 30 seconds for the feedback light to come on confirming that the message is being played, they may begin to wonder if the system has failed, which could divert them from more pressing actions. Advanced makes systems to EN and UL standards, among many others. Standards vary across the Gulf region, but local compliance is usually granted provided that a fire product is compatible with one of the standards regimes. For example, the UAE will issue a Civil Defense Certificate of Compliance to any product with EN or UL accreditation. UL-compliant systems are common in the Gulf, and are among the most exacting for high-rise buildings. Compliant systems can be managed at Command Centres, networked panels where all system information is available and the whole system and its outputs can be controlled. Command Centres are typically large, complex pieces of equipment so need to be intuitive, with clear labelling and controls (often colour coded) as they manage alarms, audio, fire service communications, smoke control, fire system settings and third party systems from a single interface. On some systems, the Command Centre has the facility to communicate with other firefighters in the building via the integrated phone system and remote outstations on every floor. These outstations can page (broadcast) instructions to occupants throughout the building, or on a particular floor, using the voice evacuation system. A microphone is usually built into the main Command Centre, and often other terminals, to allow selective paging or announcements to the while building. 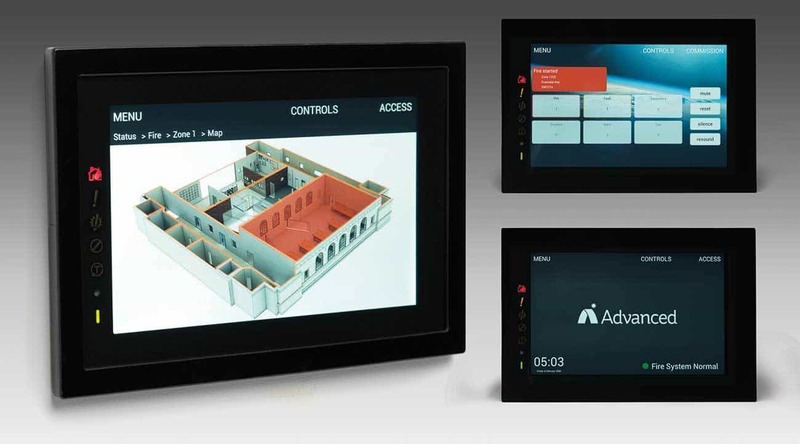 TouchControl, the new fire touchscreen repeater with Active Maps. Adequate emergency lighting in a high-rise building is vital. Modern emergency lighting panels, such as Lux Intelligent from Advanced, can self-test each luminaire and ensure they work when they need to. The range of luminaires, both traditional and LED is now huge and environmental lighting can be converted to emergency use, delivering compliance and performance benefits. In the future, we are likely to see a move towards even more intelligent systems that focus on directing the public towards a specific exit route, as opposed to simply lighting up the area. The technology to do this does exist, but with limited guidance legislation, the jury is still out on whether the public will take notice, or simply follow the crowd. Emergency lighting is not only there to ensure escape routes are visible, illumination is also needed to assist firefighters. In high-rise buildings, you also need to provide standby or ‘stay-put’ lighting to allow for non-evacuation if it is not deemed the best course of action or where occupants are marshalled on ‘refuge floors’ and awaiting safe evacuation. The final challenge is interfacing and configuration. A high-rise building’s fire system needs to interface with other systems such as suppression panels, emergency monitoring stations, building management systems, graphics PCs, paging systems/DECT phones or the internet for remote control. Ensuring interfaces are effective and do not impair the performance of the fire system is important. In summary, the fire system in a high-rise building needs to work harder than in almost any other site. The good news is that the fire industry and the standards that guide it are well ahead of the curve, providing robust and technologically advanced solutions that often surpass statutory requirements. The Grenfell Tower Fire – What will it teach us?